The College of Saint Rose signed an articulation agreement with Bard High School Early College (BHSEC) on Tuesday, June 19, which recognizes the academic achievements and provides a seamless and successful transition for students graduating with an associate’s degree from Bard College. 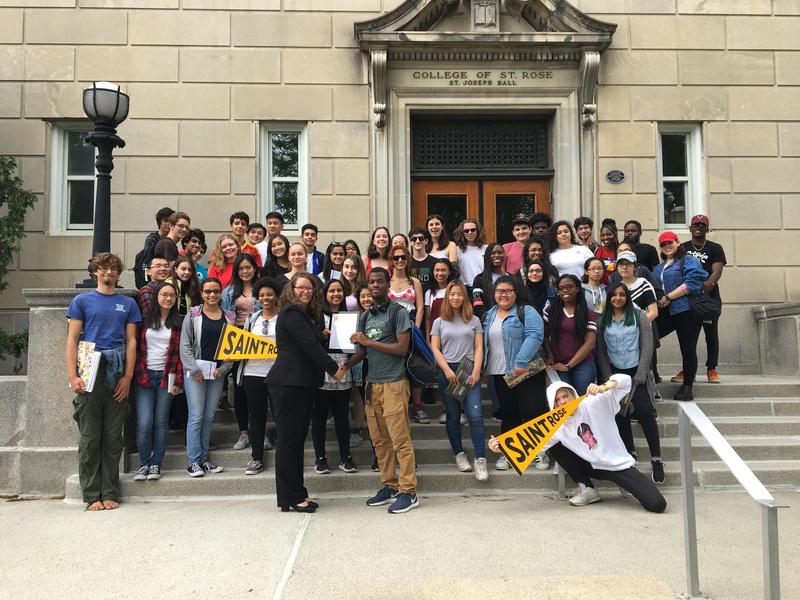 A day after the agreement was made official, over 50 students from the BHSEC program in Queens visited Saint Rose to celebrate this important partnership, learn about academic programs and offerings, and tour the campus. BHSEC provides students with a two-year, tuition-free college course of study in the liberal arts and sciences following grades 9 and 10. Students graduate with a high school diploma and up to 60 college credits and an associate’s degree from Bard College. The program has a network of tuition-free colleges in Manhattan, N.Y.; Queens, N.Y.; Newark, N.J.; Baltimore, M.D. ; and Cleveland, O.H. Students accepted into the program complete coursework in the arts, literature, mathematics, sciences, social studies, and world languages. Students can benefit from this agreement by saving time and money. Some will have the opportunity to complete their undergraduate degree at Saint Rose in two to three years. Others will have the flexibility to complete as little as 12 credits per semester, giving them the opportunity to join clubs, take on leadership roles, complete competitive internships, and volunteer around the community. “The college application process grows more complex and challenging each year. It is only made more complex and challenging by the transfer of credits from one institution to another. It is, therefore, gratifying to know that thanks to this articulation agreement,” said Hinrichs.